We're all battling a storm of distractions, buffeted with notifications and tempted by tasty tidbits of information. And just as too much junk food can lead to obesity, too much junk information can lead to cluelessness. 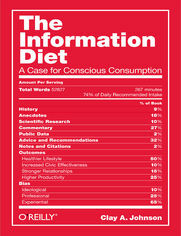 The Information Diet shows you how to thrive in this information glut—what to look for, what to avoid, and how to be selective. In the process, author Clay Johnson explains the role information has played throughout history, and why following his prescribed diet is essential for everyone who strives to be smart, productive, and sane.